This route is located about 90 miles northeast of Atlanta off of Interstate 85. From the starting point in Helen Georgia, go north on Route 17. Take a detour on to Route 356 heading east if you want to visit Unicoi State Park. Continue to take 17 north till you see Route 180 on the left (heading west). Take 180 west till shortly before you get to the town of Choestoe, you will see Route 348 on the left and heading south. Take 348 south as it twists and turns until it meets Route 75. Take Route 75 to the left (should be heading north) back towards Helen. You will meet Route 17 once again and want to go left (south) into Helen. You will be traveling along a couple different official US Government designated scenic byways on this route so you know it's got to be beautiful. You'll see Georgia's tallest mountain and travel through the Chattahoochee National Forest. The area is very hilly and the forests are thick. There are also many waterfalls in the area. The best time to check out this area is in the fall. This route travels along some perfect motorcycle roads - steep, very curvy and in relatively good condition. Also because of its remote location traffic doesn't seem to be an issue. I give it a solid 5 by Georgia standards. - View the weather forecast for this area from Yahoo weather . - Georgia Department of Tourism - 1-800-847-4842.
on January 19, 2013 4 out of 5 members found this review useful. The GA-348 Richard Russell Scenic Parkway portion of this is one of my favorite rides. on May 11, 2008 3 out of 3 members found this review useful. on September 27, 2013 2 out of 2 members found this review useful. This is by far my favorite route in GA. I normally avoid Helen and arrive from the north, traffic backs up for miles on the weekend going into Helen. Be careful of gravel on Route 348 on the south side. Traffic on this route is very minimal. The most traffic you will experience is on Route 17. When on Route 180 I would recommend making the short trip up to Brasstown Bald, the highest point in GA. High elevation change, very twisty road, and crazy bump in the road towards the beginning on the way up. on October 23, 2010 2 out of 2 members found this review useful. I made this ride 22 Oct 2010 after midterms at b-school. I ride an 07 Triumph Daytona 675, and it was absolutely gorgeous. The ride up from Atlanta was a bit rough, but once I got up to Helen and hit this route the weather, roads, scenery, and other motorcyclist I met at the few stops I made to take pictures made this ride the best! This was my first mountain ride but it was beautiful. I can't wait to do the longer route in the spring. on November 22, 2011 0 out of 0 members found this review useful. Nice loop. Helen was a bit congested as Octoberfest was in process and the area in general had more traffic than on previous runs. Great colors. on October 21, 2008 0 out of 0 members found this review useful. 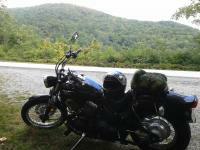 I dropped down out of N.C. on 17, turned West on 180 and traveled to 348, turned left and stayed the night in Helen. I got on 180 at 6 pm and was driving right into the sun. I was still able to enjoy most of the views, and they were good. No traffic to speak of. The leaves are catching some good color now.